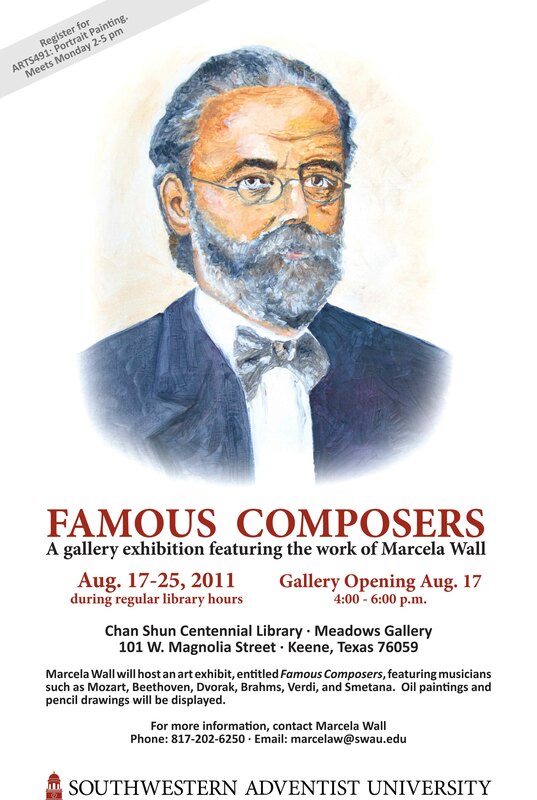 The world of art meets the world of music when Marcela Wall hosts a special on-campus art exhibit featuring famous musical composers. The exhibit will take place at the Chan Shun Centennial Library during regular library hours. It will open on August 17 and be available until August 25. A special Gallery opening is scheduled for Wednesday, Aug. 17 from 4 to 6 p.m. The exhibit will include a wide range of both pencil drawings and oil paintings, all created by Marcela Wall. Her artwork will feature musicians such as Mozart, Beethoven, Dvorak, Brahms, Verdi, and Smetana. For those interested, she would also like to talk to you about joining her portrait painting class that meets on Mondays from 2 to 5 pm. For more information, e-mail Marcela Wall at: marcelaw@swau.edu, or call (817)-202-6250. “The Sound of Music,” the classic film starring Julie Andrews and Christopher Plummer,and directed by Robert Wise, will be presented on Saturday, Jan. 18, at 6:30 p.m. in Wharton Auditorium. This looks fantastic and I look forward to coming out for it!